Research firm iSuppli has performed a teardown analysis of Amazon's Kindle Fire tablet and concludes the tablet is sold at a small loss. The device has a bill of materials of $185.60, but when manufacturing and margin expenses are added the cost rises to $201.70, and this figure does not include additional expenses such as the software, licensing, royalties and other expenditures. The Kindle Fire is sold by Amazon for $199, indicating the company plans to make up the difference via content sales. 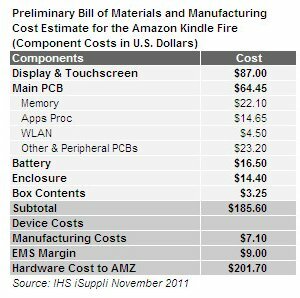 Amazon’s Kindle Fire media tablet carries a BOM cost of $185.60, according to preliminary findings from the IHS iSuppli Teardown Analysis Service. When manufacturing services expenses are added, the cost increases to $201.70, as shown in the table below. This is slightly lower than the IHS virtual estimate of the Kindle’s cost issued in September of a BOM amounting to $191.65, and a total of $209.63, when factoring in the manufacturing and the margin expenses. Please note that this teardown assessment is preliminary in nature, and accounts only for hardware costs and does not include additional expenses such as software, licensing, royalties or other expenditures. Surprise design wins in the Kindle fire include the use of a touch screen control- integrated source from the previously unknown source Ilitek and a wireless local area network (WLAN) module from new supplier Jorjin. The use of an unfamiliar source for the touch screen controller integrated circuit (IC) reflects the growing trend of new suppliers entering the market. Amid booming sales for touch screen devices, IC suppliers have jumped into the fray to satisfy the increase in demand. This trend toward employing lesser-known sources is evident in recent designs including the Vizio tablet, which featured a touch control IC from EETI—and the Lenovo A60 smartphone, which employed a touch control IC from FocalTech Systems. The use of the Jorjin WLAN module also represents a surprise, given that most tablet designs employ more complex combo solutions from Broadcom or Texas Instruments. The Jorjin device provides a cheaper approach to implementing WLAN support, at just $4.50, yielding a $1 savings in BOM costs. Texas Instruments Inc. (TI) dominates the Kindle Fire design. Most notably, TI contributes the applications processor, which provides the core functionality of the tablet. The TI OMAP4430 processor costs $14.65, accounting for 7.9 percent of the Kindle Fire’s total BOM. However, TI also supplies other devices, including the power management device and the audio codec. This gives TI a total of $24 per each Kindle, or 12.9 percent of the BOM. TI’s OMAP4430 applications processor has been identified in an increasing number of designs dissected by the IHS, including Research In Motion’s PlayBook RDJ21WW tablet, as well as the Motorola Droid Bionic XT875 and LG Optimus 3D P920 smartphones. The OMAP4430 is a dual-core ARM Cortex-A9, 1GHz processor with a IVA 3 Hardware Accelerator and a SGX540 3D graphics core. The device supports 1080P 2-D and 720P 3-D graphics, and is produced using 45nm process geometry. The single most expensive subsystem in the Kindle Fire is the display and touch screen, at a combined cost of $87.00, or 46.9 percent of the BOM. Amazon sources the display from two companies: LG Display and E Ink Holdings. The display uses E Ink’s FFS technology, which LG Display has licensed. Improved production yields and efficiencies have assisted greatly in reducing the cost of FFS tablet displays. In the same vein, touch screens have made big strides in cost reduction during the course of 2011. The Kindle Fire incorporates 8 gigabytes of eMMC NAND flash memory. In the individual Kindle Fire torn down by IHS iSuppli, the NAND flash was supplied by Samsung. The eMMC NAND flash is fairly popular with most manufacturers, as it includes memory management circuitry. IHS had assumed originally that the Kindle Fire might have as much as 8 gigabits of low-power DDR2 DRAM memory. In fact, the Kindle Fire ships with only 4 gigabits. This shaved off a few dollars from our previous cost estimates. Elpida was the supplier of the DRAM in the individual Kindle Fire torn down by IHS iSuppli. Together, the NAND and DRAM form a memory subsystem costing $22.10, or 11.9 percent of the total BOM.